I got downstairs just in time to hear the unmistakable sound of a terrified bird hitting a window, and to see the unmistakable drifts of grey feathers and spatters of bird poo all over the dining room. Our cat is not much of a hunter. More of a stalker. More of a sit-and-watcher, really, with the exception of night crawlers. He’s very good at catching slow things without legs, and leaving smeary dismembered trails of them all the way up from the basement to the worm-play area in the kitchen. I had begun to think the squirrel he bagged back in October was a one off. I was wrong. A stunned robin lay in my sheepskin-covered rocking chair at the back of the house. Howl was on the floor, contemplating it with wary interest. There is a reason his nickname is Tenderfoot (also My Velvet Friend, Ooja Booja and others, but we won’t go into those): he does not get the whole “kill it and eat it” thing. If he was going to kill it, I wished he’d done it quickly outside. If he was just going to torment it I wished he’d done that outside, where at least another cat would polish it off as soon as it got the chance. I ran to the basement for a towel and threw it over the bird, then looked for an easy way to get it outside without Howl following. He always slips out the front door with us. The windows all have screens. The kitchen door opens onto a 3-foot drop to the ground where we demolished a rotting deck. He never goes out that way. So, I opened the kitchen door, went back to the robin, and scooped it up in the towel. Hooray! No poo on the sheepskins! I carried it to the door. I looked down. Directly into the expectant, furry face of a neighbor cat. It was a cartoonish moment. Not only did I have to get the robin outside and keep the cat inside, I had to get the robin out and deposit it somewhere none of the many other cats in our neighborhood could reach it. Like the porch rooof! Upstairs, I managed to open our bedroom window and get the screen off one-handed, cradling the towel against my chest. 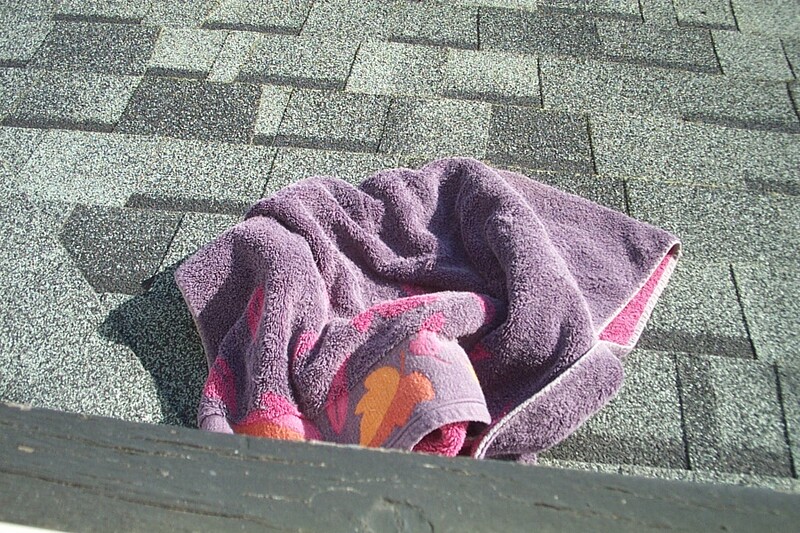 I put the towel out on the porch roof. The bird just sat there. 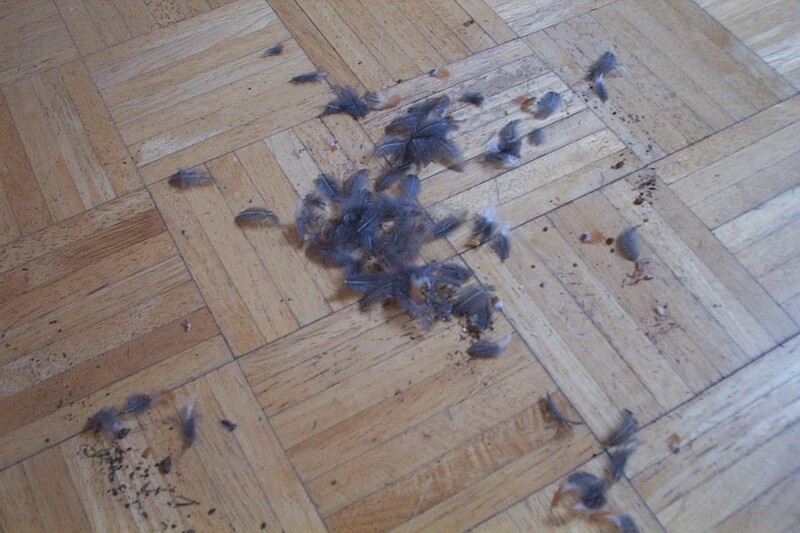 I didn’t have high hopes for it with all the feathers it had lost, but I shut curtains so the cat couldn’t leer at it through the window, and when I came back after sweeping up the feathers and wiping up poo, I saw this. Sometimes these things have happy endings. Not as much frivoling has been going on as I’d hoped, and no weaving. Visiting two different sets of family wiped me out. Next time I will have to remember to schedule my frivolity without any family visits stuck to it. Frivolity and relatives: it’s like sewing a greasy ten pound socket wrench set to your Harlequin costume instead of spangles, and capering with a clang clang clang. I thought it might be time to let you know how I did with my list. 1. I meant to buy seeds. I did. As you know. I also bought starting mix and flats and inserts and clear covers at a professional landscapers’ supply store, and set up trestle tables for them in the basement. The house we’re renting and renovating was a creamery in the nineteen-teens. There is a sort of a daylight basement–better call it a daylight cellar–with a dwarf-door where the milk trucks drove up. You can still see the areas of raised cement and ancient rubber tile where the milk processing equipment was bolted. The unusually well-lit basement is one of my favorite things about the house, which makes it an extra-special bummer that the spatially challenged vandals who had it before us turned the basement into a moldy mess. The southwest corner of this basement has banks of windows on both sides. It’s a perfect place for starts. I’ve done seven flats so far. Four or five to go. Each flat takes about an hour. I’m not sure why it takes so long, but it probably has something to do with all the running back and forth from the workshop, crouching on the cement floor, wetting and rewetting the starting mix by dribbling water from a bottle over the cells, and tweezing the seeds. Seven flats is definite progress. 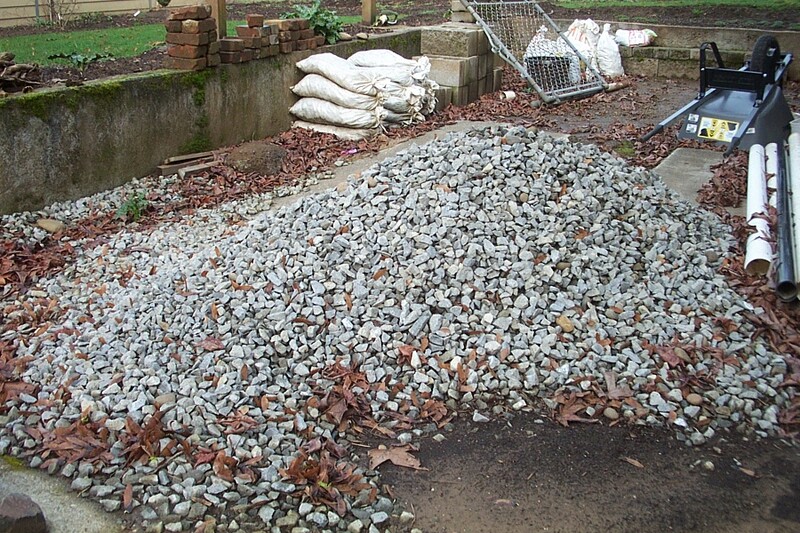 Free u-haul gravel? Anyone? Please? 2. Presents for toddler nieces? Done. I chose books because they were easy to pack on a plane. I can only assume they were a success by the number of times I was ordered to read them aloud. I could say a lot more about toddlers. I won’t. Except that the 18-month-old who took a special shine to me is going through a patch of ABSOLUTE MONSTERHOOD. I have six younger half-siblings and I don’t remember any of them being that bad, ever. It’s a good thing the little girl liked me so much. Otherwise I’m not sure I’d have gotten out of there with my life. Some of the malevolence (yes, malevolence; not mischief) served a dual purpose of attention-grabbing, but most of it is her normal behavior according to my sister. The only relief was nap time. Blessed nap time. This eighteen-month-old has such a strong will that she bosses the just-turned-four-year-old. 3. Try out my new craft purchases–a round knitting loom and a small frame loom for bands. Knowing that most of you are knitters as well as weavers, I find it a little hard to explain why knitting and I are Green Day and David Bowie to each other, or why a knitting loom (knitting loom?) seemed like a good idea. At first I thought it would be straightforward: the most direct route to a merino wool hat. I discovered that there is a whole complicated universe of peg-loom-knitting madness. I read long books and watched an instructional video. I made a long tube of samples. It’s a perverse craft that insists on using a frame to do what can be more easily done on needles. Less versatile, less portable, not necessarily faster. Remind you of anything? Oddly enough, I was able to understand needle knitting much better by seeing how the different combinations of stitches were produced on the frame; things I had never really grasped before–reducing, increasing, how that incorporates into garment construction. I had been correct in thinking I am not a knitter. The only hand knits I’d like to own are hats and gloves and socks. Offer me a bias cut wool jacket or a knitted sweater, and I will take the jacket. Offer me a sewn cardigan with a zipper or a hand-knit folk sweater, and I will take the zipper cardigan every time. It’s vanity, really. I look really bad in stretchy, drapey, or baggy clothes, so I developed a taste for wovens. And I like my clothes to last, because any time I find a piece of clothing that fits my square shoulders, long arms, short waist, high hips, narrow thighs, and long legs . . . it is a triumph not soon to be repeated. If one doesn’t enjoy knitting for its own sake, a hand knit sweater’s life span is too short to be worth the effort of making it from scratch. A peg-loom-knitted hat every now and again is pretty much all the knitting I have in me. Still, I’m glad to have that much, because it means I can make hats out of yarn I like. I want two more knitted hats, and I have the yarn for them, but I’m really, really bored. The interesting part is calculating gauge and seeing how much variation there is when you do different stitch combinations with different weights of yarn. The rest is just repetitive strain injury in the making. The frame loom for bands (a Beka) didn’t work out. When I was shopping for it, it was impossible to find any photos that showed the design features I was curious about, so maybe I will take some pictures and explain before I sell it on ebay. 4. New coat. Yes. The day we were loading the Christmas tree in the car for recycling, I carried the trunk. Serbian Spruces are lovely, but they have an odd habit: they release great globs of pitch from their cut ends. Quarts of it. I had forgotten about this. By the time I’d finished pushing the tree into the car, my old WWII refugee coat looked like it had had been sneezed on by a very sick elephant. I shivered in my spring jacket for a couple of weeks before I found another. It needs to be taken in, but it doesn’t look too bad as it is.